Make your own Simple 2 Ingredient Pizza Dough in under 10 minutes flat! This recipe couldn’t be easier, even a small child can make it! Combine the ingredients in a mixing bowl and mix well, then knead for 5-8 minutes until dough is pliable and soft. Immediately roll it out, add your desired toppings and bake as you would any regular pizza recipe! This worked a treat! I used 350g flour and 350g plain yogurt. Kneaded very lightly and simply topped it with garlic butter. Then sprinkled parsley over 2 and Italian herbs over the other 2. For extra decadence, topped 2 of them with bacon bits. 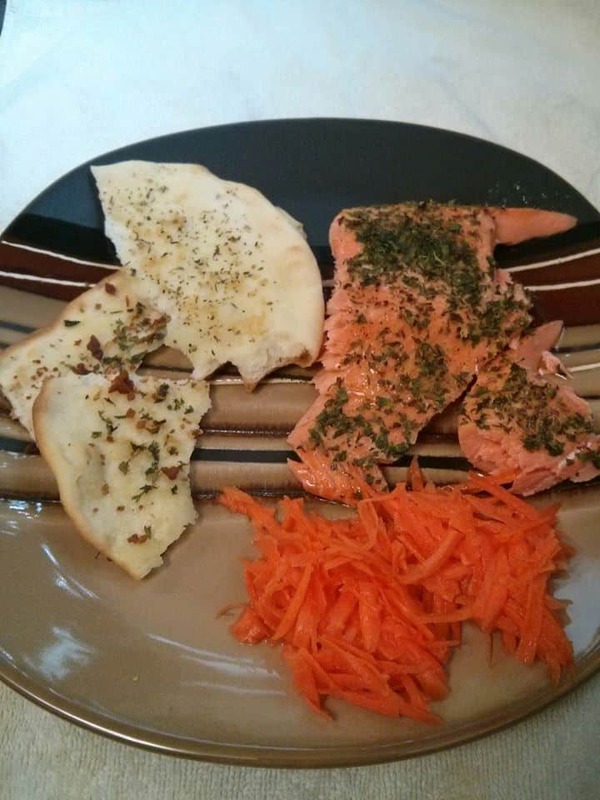 Served with baked trout (baked in the same amount of time at 400°F) and a carrot salad. This one is a keeper. It was the most delicious dinner I’ve had in a long time.